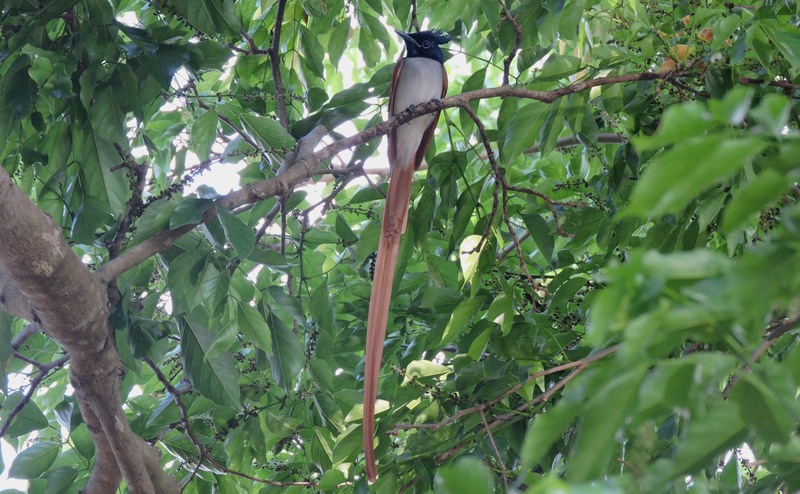 About two months ago I had written about the Asian Paradise Flycatcher. I lamented about having never seen the white-morphed male. Just a few days after that, during a trail in the Thekkady foothills, I saw an adult male (orange-morphed) land on a tree a few feet away. Like a curious bystander, he flew from branch to branch until he was directly above me. The timing was exquisite. A minute or so before I spotted him, I was talking about his continued and inconspicuous absence from my life with an experienced birder who was accompanying me. I told him how I might do something ridiculous if I ever saw a fully white-morphed Asian Paradise Flycatcher. When I first sighted the Malabar Giant Squirrel in Kodaikanal, I came back home and changed my life. A chance spotting of the Lion-Tailed Macaque at Parambikulam led me to turn vegan and grow sideburns. I was pretty sure I would do something drastic for this bird. Sell a house. Cut off a toe. Change my first name to make it sound less asexual. As it turned out, I just sheepishly grinned. I then tugged at my friend’s collar and pointed out the bird to him, before pulling out the camera. I expected a bigger reaction. Perhaps I obsessed about him too much. Or that he was still bathed in the blood of golden peaches; not yet a fully-fledged ivory male adult. I thought about these things only during the bus ride back home. At that moment, when he fluttered his tail feathers and showed me his perfect crest, I felt my head turn into a pillow. A warm, soothing silence descended upon the thorny terrain we were on. Nothing more. Nothing less. I spotted two other birds, I had been dying to see before, later that morning. The stunning Golden-Fronted Leafbird and a pocket-sized cartoon of a Layard’s Flycatcher. We had visited a farm in the foothills, which was home to some of the most gorgeous birds I had ever seen. At one point, I saw a Black-Headed Oriole pick apart a caterpillar a few trees away from a Common Iora couple dancing to the heartbeat of the sun. There was also the excitement of planning escape routes in case of elephant attacks. My friend seemed glad that I could swim. I imagine, also that he could outrun me. But nothing wacky or scary happened. Instead a tough-to-photograph Tickell’s Blue Flycatcher, a Banded Bay Cuckoo and a Malabar Grey Hornbill showed up too. 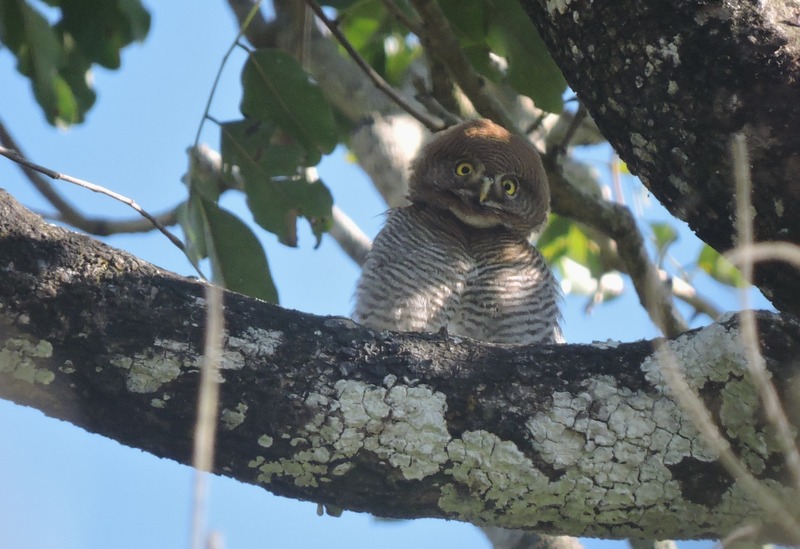 And then there was the joyful panic attack of spotting four different types of owls in a single day – the Indian Eagle Owl, Brown Fish Owl, Jungle Owlet (two sub-species) and the Spotted Owlet. I cannot even describe the effect that the Jungle Owlet had on me. In a few days, maybe. A shorter trail the next day in Thekkady was fantastic too with Indian Pittas, Serpent Eagles, Racket-Tailed Drongos and White-Bellied Treepies showing up to say hello. It was a wonderfully strange birding weekend. In a way it had me convinced that a bird in hand is worth an Asian Paradise Flycatcher in the bush. But thanks, sweet prince of paradise. The pleasure was all mine. Great work there. This bird reminds me of the Quetzal found in Central America. Nice shot. Thanks Alix! I never knew what a Quetzal was until now. She is utterly gorgeous. See a picture of both male (juvenile) and female on my site under Birds Feb or March 2014. It was a hoot and three quarters cuter than anything else I have seen too! Bravo! A great selection here and as engaging a post as ever. That cutie owlet reminded me of Mumbles from Happy Feet, just not a penguin but an owl. Okay, that’s enough coffee for me. I’ve yet to visit India, so it exists only as images in my mind, most often pictures that contrast intense urban crowding and poverty and sparse populations scratching out existence in the bleak countryside. I know there is much more and your captivating stories of birding adventures both delight my mind and entice me to know more. I applaud your courage and reckless abandon to follow the spirit of wildness that seduces you into exploring India’s Natural beauty and then sharing them so eloquently with the world. Have you ever considered taking your “show” to young students? Much thanks, I look forward to the next magical journey. You make me feel good about this writing shtick of mine that I spend a good part of my nights with. I’d thank you again but instead I shall assure that I don’t intend to stop writing regularly anytime soon, comrade. I’ll see you here again! loved the photographs…the one and only time Ive seen the paradise flycatcher was when a birdlover friend was showing me the tree where it is seen sometimes..and as we looked up there it was…one of the strangest experiences I’ve had.. 🙂 thanks for sharing this..
aww did ya. i hope you write about it soon, sounds like something i’d love to read! ” felt my head turn into a pillow”… fantastic! thanks sushi, i loves me some spotted owlets too, these are such adorable cartoons! The way they twist and turn ❤ We have owls here..tiny ones. Pecking at my window at night sometimes. I wonder what are they called. ayyo you have so many pwetty neighbours, lucky you! 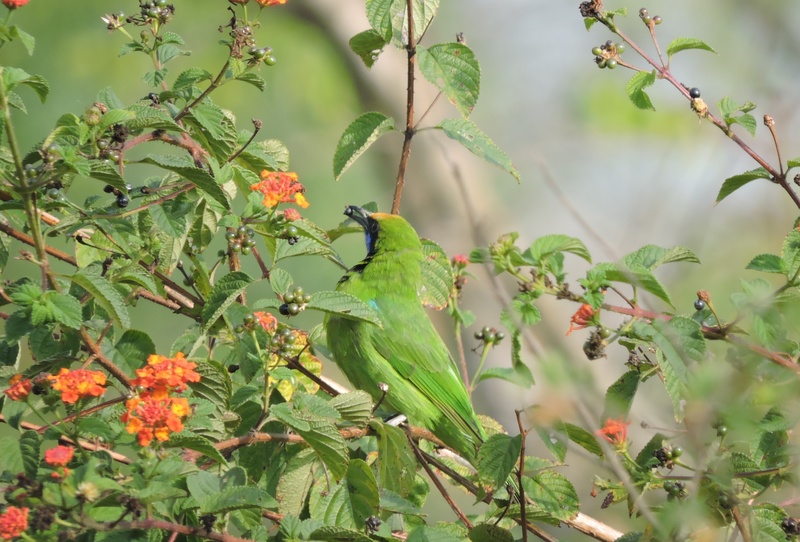 the rufous treepie and rose-ringed parakeets only are found near my home. Hehhe…I have a lot of pics and will take many more in the summer (no waking up in winters…brrr). I have the owl pic also. Maybe you can tell me the name of the exact species? After the18 months hiatus since we ceased being colleagues, it is wonderful meeting you again and i am glad i regained the acquiantance. Christy, the writer-turned-naturalist….simply love this avtar of yours! thanks, dear friend 🙂 tis a pleasure to see you around these parts! I already miss India a lot. Reading such great articles makes me feel like going back to explore India’s every nook and corner, see all bird and animal species.